Holla is a simple group chat application that Developer Alex MacCraw describes as being a little like an open-source version of Campfire, 37Signals’ collaboration tool. Holla doesn’t have all of the advanced features that Campfire has, like built-in conference calling. However, it does support file sharing, and it’s free and runs on your own server, so you get to retain a degree of control that you don’t have with hosted web apps. It’s simple and easy-to-use. Users can create “channels” (chat rooms) for projects or teams and invite others to join them. Conversations are shown in the large pane in the center of the window. Files can be shared through the app simply by dragging them and dropping them onto the chat window; any images that are uploaded are displayed with a live preview. One small irritation that I noticed when testing out the demo is that the chat window doesn’t actually update in real-time; I’d occasionally have to refresh my browser window to see the latest update from the other users. Additionally, users do need to upload an avatar, otherwise it’s difficult to determine who said what, and also the “chunky” design means that busy conversations would require a lot of scrolling to follow. However, it works pretty well and as it’s an open-source project, it can be built upon or modified as required. If you’re looking for a basic self-hosted group chat app it’s certainly worth checking out. Holla is a Rails application; it can be downloaded from Github. If you’d just like to try it out, there’s a free live demo here. What group chat apps do you use? The advantage over IRC being more granular user authentication, I guess? yeah i think it’s a really great work! waiting for new features too! thanx! Not bad, did you guys see http://jaconda.im ? It has everything and more. 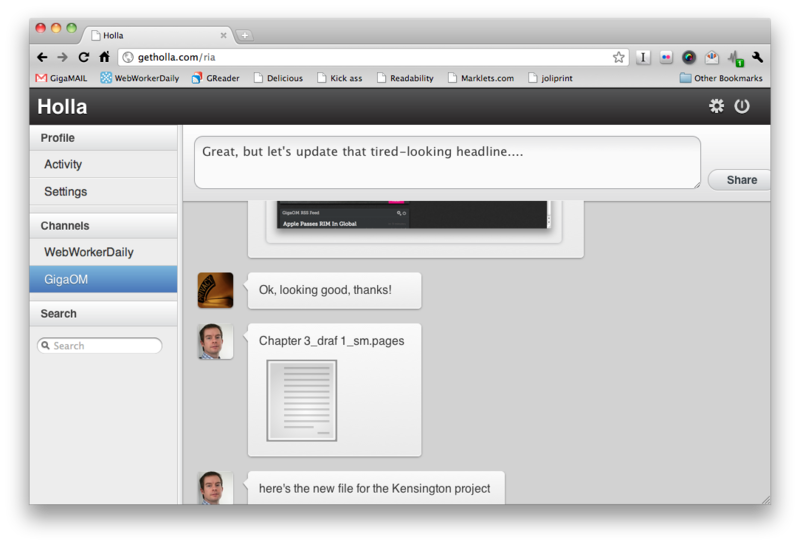 Web+Jabber Chat and integrates with Git and other stuff. Thanks for the reference to Jaconda, that looks really cool! well , it’s a great work .. i hope to see all other advanced features in the coming version ..